Outside of Hollywood and Hogwarts, the idea of a multiple universe reality seems rather ludicrous if you think about it. After all, the universe includes the totality of space and time and energy and physical constants and dogs and, yes, even teenagers. It's such an all?inclusive definition that it's hard to imagine that there's more to things. How, then, can there be multiple universes? Let's forget the idea of multiple universes for a moment and ponder the concept of a single, simple, solitary, stand‐alone universe. To me, "the universe" is a term used to denote everything that exists physically. But, what does it mean to say something exists physically? The implication is that we can experience it somehow ‐ we can smell it or taste it or ferret out a signal implying its existence using a sensitive scientific experiment. Is it possible to imagine realms that might exist without a physical or causal connection to our known universe? You bet. It is possible to imagine such realms and that's where the multiverse comes in. It's not just the multiverse, however, for there isn't a single such concept. Rather there are many different multiverse concepts, some inferred from modern science while others are more a matter of faith. The exact number of multiverse schemes floating around is difficult to pin down since it depends a bit on who you ask and how they define a multiverse. In a recent survey of subject I ran across eleven distinct multiverse concepts. Though the thought of being part of more than one multiverse is delightfully perverse, the plurality of multiple universe concepts makes the situation very confusing. It is helpful to classify the multiverse schemes in terms of how the universes are separated: by space and/or time, along dimensions other than space and time, or by faith. Faith‐based multiverse concepts are nothing new. They are, as you might expect from the name, a matter of faith and not inferred from current scientific theories. For example, many people believe deeply in separate planes of existence. Consider the Christian concept of Heaven. A common theme is that Heaven is a separate plane of existence where a soul enjoys eternal life and pleasure in God's presence and in the presence of other elect souls. There's nothing in this that a physicist would consider as a scientific, causal connection between Heaven and our universe. Consquently, this "Heaven‐plus‐here" idea is a form of a multiverse -- a faith‐based multiverse. Similar faith‐based multiverses are advocated by the adherents of most other religions. Though these visions may be different in detail, I categorize them all as a single multiverse concept. Multiverse concepts inferred from mainstream scientific theories are quite new, having been driven by ideas in quantum mechanics and cosmology in the last hundred years. Perhaps the most recognized multiverse concept of this was developed in the mid-1950s by young physicist named Hugh Everett. It lies at the core of quantum mechanics and involves parallel universes separated by dimensions other than space and time. Quantum mechanics is quite unlike other areas of physics. Generally, physical theories lead to a particular outcome for a particular situation. If you throw a rock at this angle and that speed, a physicist can calculate exactly where it will land. In quantum mechanics, however, the outcome of physical processes cannot be predicted exactly. Instead, what is calculated is a probability distribution of what can happen. In Everett's interpretation of quantum mechanics, known as the many worlds interpretation, in each quantum mechanical process all possibilities that could happen actually do happen and evolve as separate emergent realities in the overall description of the universe. The mathematical space used in the quantum mechanics calculations includes not only the three dimensions of space and the dimension of time, but also other quantities relevant for the calculation -- the momentum or the orientation of a particle that is part of the calculation, for example. Those other quantities are treated in the calculation as if they are additional dimensions in the problem. The different threads of reality emerging from a quantum process occupy different places in the overall mathematical space used in the quantum mechanical calculation -- in much the same way things can be separated by distance along spatial dimensions in normal space. These emergent threads of reality are causally disconnected once separated and effectively become parallel universes in a multiverse which I call the many worlds multiverse. Most of the newer multiverse concepts arise from cosmology. Generally, these cosmology‐inspired multiverses tend to have universes separated in space and/or time. The leading scientific theory of the evolution of our universe is called the inflationary, hot big bang model. In this theory, what became our universe started out very tiny -- perhaps as a quantum fluctuation. Then, in the briefest of instants, it became vastly larger than the observable universe at that time through a process called inflation. After this moment of inflationary expansion, the expansion of the space slowed dramatically and the energy driving the expansion was dumped into the radiation and subatomic soup of particles of the early universe. As the universe continued to expand and cool, the particles and forces evolved into what is observed today and gravitation caused the material in the higher density regions to collapse into the stars and galaxies that surround us. Two distinct multiverse concepts are spawned naturally in the inflationary, hot big bang picture. During the period of inflation in the early universe, the tiny region including what became our universe was blown up to be vastly larger than our observable universe. This means there are regions of the greater reality which are similar to what we see in our universe in terms of basic physical laws and yet are so far removed from us (and each other) that they are now, and will always be, out of causal contact with us. These regions collectively constitute a multiverse, which I call the beyond‐the‐horizon multiverse. Within this multiverse, causally disconnected regions share the same physical laws but differ in terms of their initial matter density distributions. The initial matter distribution in the universe ultimately determines the structure in that universe like stars and galaxies and dogs. Physicists have calculated the number of such causally‐disconnect regions in the beyond‐the‐horizon multiverse to be larger than the number of possible variations in the initial conditions -- meaning that all possibilities for the initial conditions must be present in the multiverse. Anything that could happen does happen within the greater multiverse. The second multiverse springing from the hot big bang model arises because inflation, once started, may not stop except at random points where quantum fluctuations in the characteristics of the space cause inflation to stop. This effectively leads to a greater reality consisting of an eternally inflating matrix of space in which bubble or pocket universes are formed in the random and causally disconnected spots where inflation stops. This is known as the bubble multiverse. Each bubble universe within this multiverse might have a different dimensionality and a different set of physical constants. In other words, our universe is part of just one bubble in the great bubble multiverse and the physical laws and forces and particles present in the other bubbles are different from what we see, with all possibilities being represented in the multiverse. The examples above illustrate one of the most intriguing aspects of this business. The bubble multiverse, if it exists, contains regions within it that are, potentially, beyond‐ the‐horizon multiverses. In addition, the many worlds picture of quantum mechanics might underlie the physical processes taking place throughout the bubble multiverse. Three multiverses in one! Yikes! The great reality in which we live may consist of multiple multiverses. The question is not "do we live in a multiverse?" 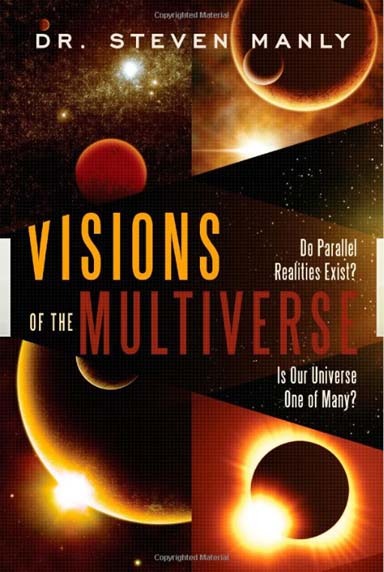 Rather it is "do we live in multiple types of multiverses and, if so, which ones?"